Purses have become an urban companion. Long gone are the days when a purse just carried our makeup, wallet, and keys- in this digital age we need our seemingly plethora of smart devices to keep us ‘connected’ to the world around us. 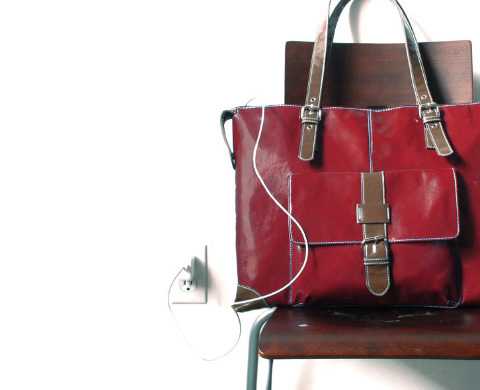 Thanks to the crafty minds at Minneapolis-based handbag company Urban Junket, you’ll never have to worry about being disconnected ever again. Introducing their Power Trip rechargeable laptop bags. Made from Eco-friendly materials and reclaimed plastic bottles, these clever, chic, and industrious carriers have become the answer to the prayers of tech junkies everywhere. The Power Trip laptop bag comes in two styles, the Angela and the JB, both featuring Urban Junket’s unique and ingenious design of their Joey battery; a smart battery that knows when it is giving or receiving power without any switches or buttons to tell it to do so- just connect and go. The battery can withstand a charge for 10-days or 2 complete smart phone charges and is compatible with USB and Micro USB devices such as smart phones, mp3 players, e-readers and Bluetooth devices. In addition to its impressive brains, the Power Trip bags are equally beautiful. Available in seven attractive colors, these sophisticated totes are perfect for any profession, occasion, or pair of shoes.